Amid Measles Outbreak, Italy Makes Childhood Vaccinations Mandatory : Parallels A tough new law means parents who don't vaccinate their children against a dozen diseases will face steep fines — and even risk losing custody. Italy has recorded 2,500-plus measles cases this year. Demonstrators in Rome protest June 11 against imposition of vaccine requirements. A new law requires childhood vaccination against 12 diseases. Emma Carpita is just 2 weeks old. Her parents, Federico and Loredana, have brought the crying infant to her first medical checkup. Dr. Patrizia Franco, Emma's pediatrician, hands them a list of vaccine centers in the area. "Do you have any questions or concerns?" she asks. "No," says Federico. "We think all parents should be obligated to vaccinate their children." But not all Italians agree — including Franco herself. The pediatrician is a vocal advocate for the "freedom to choose" whether or not to vaccinate, an increasingly popular sentiment in Italy in recent years. "What I care about is the patient's health, and to first do no harm," Franco explains. "Every medical procedure has a risk. That includes vaccines." But last month, Italy made vaccines against 12 diseases — including measles, tetanus and rubella — mandatory. Kids up to 6 years old won't be accepted into nursery schools without them. And parents sending their children to school after that age without vaccinating them first will now face fines of up to $8,380. Repeat offenders can even lose parental custody. The law has sparked protests. 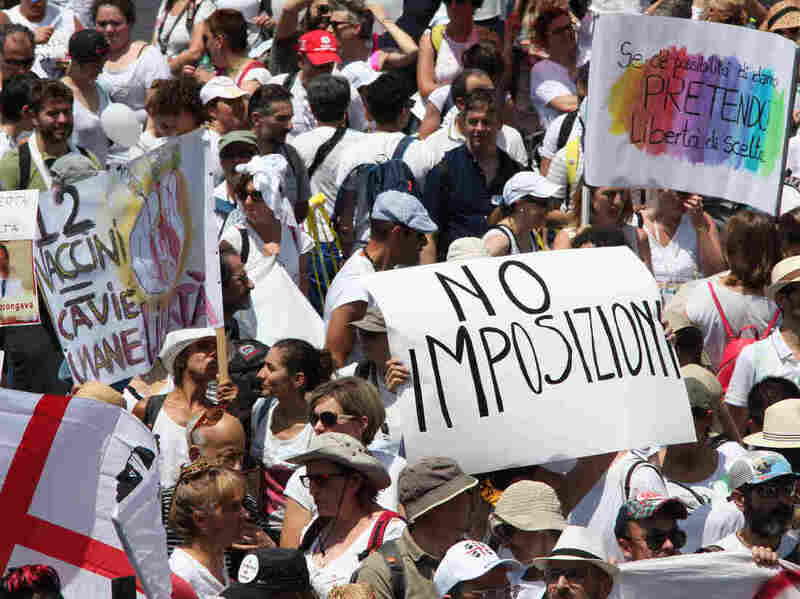 On a recent summer day, parents and other protesters demonstrated in front of the Italian Parliament, chanting "Freedom!" and accusing the government of going too far. "No to mandatory vaccines! Yes to the freedom to choose," they shouted into megaphones. Such skepticism about vaccines is helping fuel a measles outbreak that is hammering Italy, says Roberto Burioni, a professor of microbiology and virology at Vita-Salute San Raffaele University in Milan. "People are not vaccinating their kids. This is the simple reason," he says. "When the vaccination rate is around 95 percent, the virus is not able to circulate in the population. We are well below that threshold, and this is causing the outbreak, which can be very dangerous." Measles is highly contagious. It can cause serious complications, including pneumonia, blindness and encephalitis, and can be deadly. According to Italy's National Institute of Health, measles vaccinations among 2-year-olds rose steadily until 2010. That year, the vaccination rate was just above 90 percent. It dropped to 88 percent in 2013, 86 percent in 2014 and 85.3 percent in 2015. So far this year, the Italian Health Ministry has recorded more than 2,500 measles cases — already a tenfold spike from just two years ago. The outbreak prompted the Centers for Disease Control to issue a U.S. travel advisory for Italy in April. It eventually led Italy's lawmakers to enact the country's strict new law on May 19. So why the growing vaccine skepticism? Italian officials point to Beppe Grillo, a wildly popular stand-up comic and the leader of the country's major populist party, the 5-Star Movement. In a routine from 1998, he mocked vaccines for "weakening children's immune systems" and alleged, without evidence, that they are a Big Pharma scam. Italy's health minister, Beatrice Lorenzin, has accused them of fomenting "grave and dangerous anti-scientific disinformation ... that in recent years has driven people not to get vaccinated." "I think we have made a lot of mistakes," concedes Elena Fattori, a senator with the 5-Star Movement. "At the beginning, we thought we should give voice to everybody. But now I'm convinced that sometimes some things are so scientific, that you cannot give voice to everybody. Science is not democratic." But to believe this is the 5-Star Movement's last word on vaccines is a misunderstanding of its uncanny ability to shape-shift, says Marco Cattaneo, the editor-in-chief of the Italian editions of Scientific American and National Geographic. "They don't have a single and definite position on almost anything," he says. "So they can say, 'You're right' to someone who says [vaccines are] OK, and 'You're right' to someone who says, 'I have some doubts.' So they try to get both votes." Right now, the 5-Star Movement leads in the polls. National elections may take place later this year. Meanwhile, the measles outbreak continues to spread.